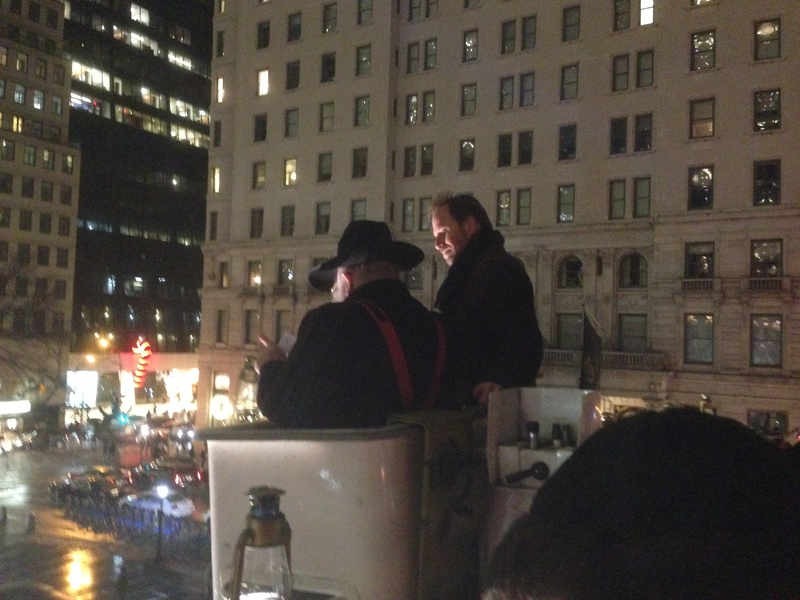 This year, I once again had the honor of lighting the Chanukah Menorah on 5th Avenue with Rabbi Shmuel Buttman. And, like last year, the world certainly could use the warmth and caring that the lights of Chanukah represent. 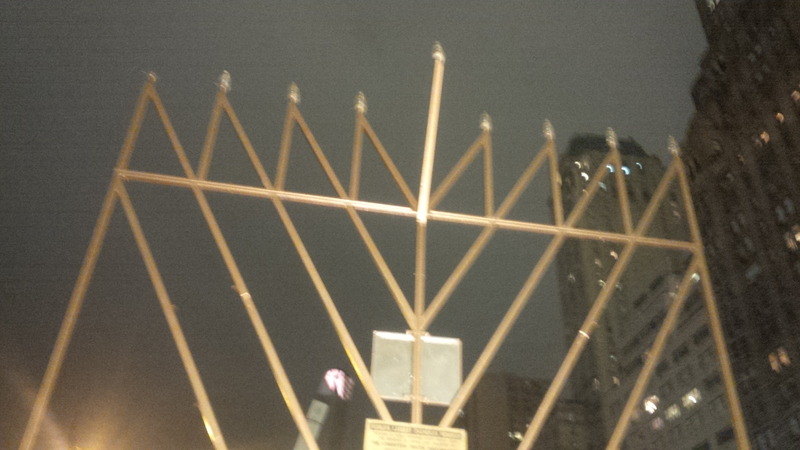 In fact, as I walked up to “world’s largest Chanukiah” here in New York City, I snapped a picture that symbolizes the essence of what New York City and America stands for: tolerance and acceptance of all peoples from all religions and all walks of life. The picture that I took was of the Chanukiah behind a manger scene for Catholic League charities with the back drop of the Plaza Hotel flying the flag Saudi Arabia, in honor of one of its owners. This picture represents the strength and courage of America where Christianity, Islam and Judaism, among other religions, can all be openly practiced at once without fear. Certainly the world would be a better place if all countries and populations would honor one another with peace, acceptance and tolerance of each other and our religious diversity such as New York City and America does. Kent Swig lighting the Chanukah Menorah. 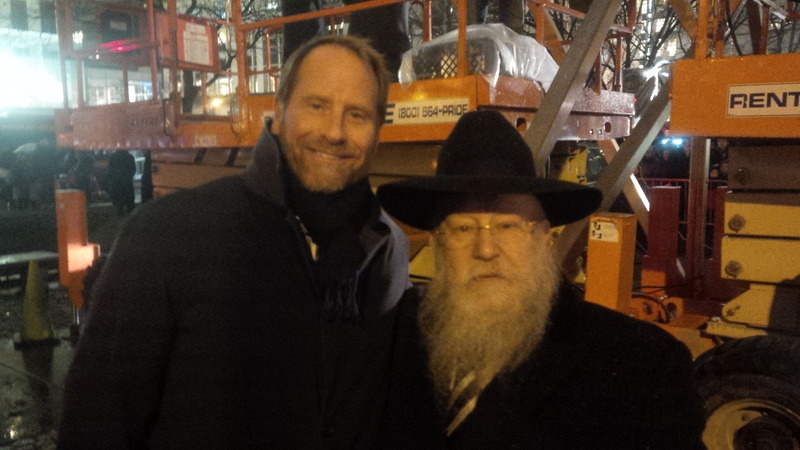 Kent Swig with Rabbi Shmuel Butman. Chanukah Menorah on the 5th Avenue, NY city. 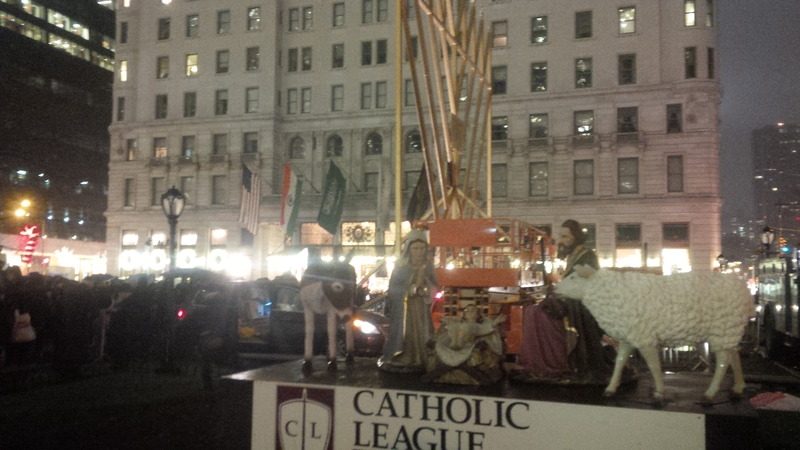 Manger scene for the Catholic League charities in front of the Chanukiah with the Plaza Hotel in the background. Today, 9/22, I watched my good friend and former New York City Police Commissioner (1996-2000), and Chairman of the Police Museum of New York (on whose board of directors I serve), Howard Safir, be interviewed on CNN about the tragic and senseless execution of two New York City police officers Rafael Ramos and Wenjian Lui against the back drop of the events of the deaths of Eric Garner in New York and Michael Brown in Ferguson, MO. In addition to this interview, Howard wrote an article about his thoughts and perspective of these events. As usual, Howard’s understanding and views are spot on, and we as citizens of New York and America should take his words and views and suggestions to heart and follow them. If we do, our cities and country will be a better, kinder and safer place to live and work. Indeed, during this holiday season, we should be seeking a time to heal and a time to work together and not being divisive nor disruptive. Now is a time to bond with one another and support one another as we mourn with the friends and families of Officers Ramos and Lui. And, this is a time to give real thanks to and express our admiration for all of those police officers who serve our great City of New York who literally put their lives on the line each and every day so that ALL of us can live a safe and relatively care-free life without constantly looking over our shoulders in fear of crime. 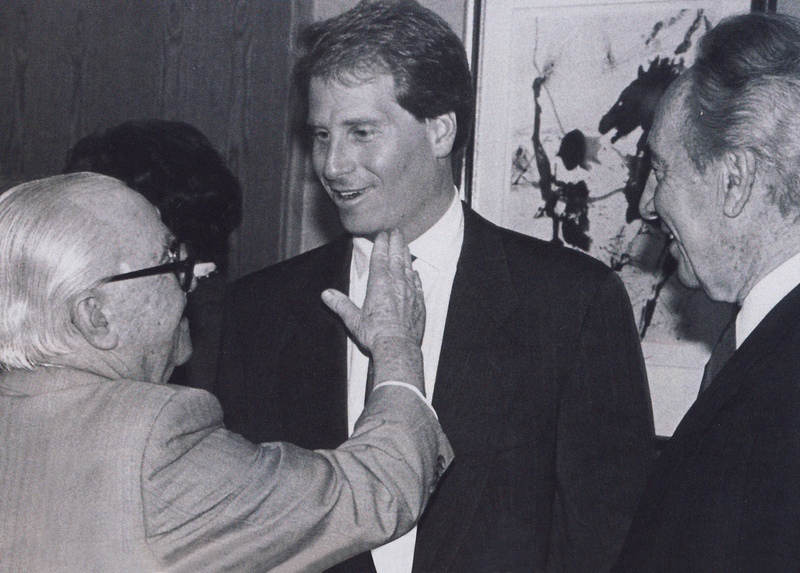 At this time of year as we celebrate the festival of Chanukah and the goodness of providing light onto one another and the world, I was reflecting back on the many hundreds of Israel Bonds events that I attended and I came across an old picture of me with Jack Weiler, my grandfather’s (Ben Swig) and my family’s business partner as well as my grandfather’s best friend, and the former Prime Minister of Israel Shimon Peres. These two great leaders have been an inspiration to me throughout my life as well as a light onto the Jewish people and to all humanity. I am so fortunate to have known these two men and to have experienced their greatness from a close vantage point. Their words and deeds are a true inspiration to me and continue to provide guidance of how I can be a better person. From right to left: Shimon Peres, Kent Swig and Jack Weiler. Recently I participated in the first-ever Career Day at Eleanor Roosevelt High School (“Elro”) in New York city, where various members of the community were asked to speak to three different freshman classes for about 20 minutes each. I was honored to be selected to participate and the morning that I spent at the school was wonderful. Elro is ranked as one of the best high schools in New York City and also among the top schools in the United States and after spending time with the students, I certainly can understand why. Their questions and comments were so insightful and it was so great to spend time with them. 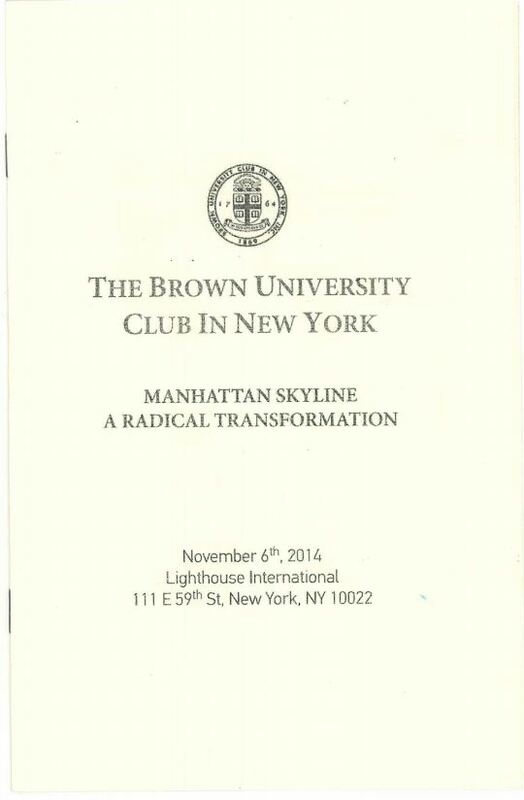 This was the second event in a series on real estate market hosted by the Brown Club in New York. 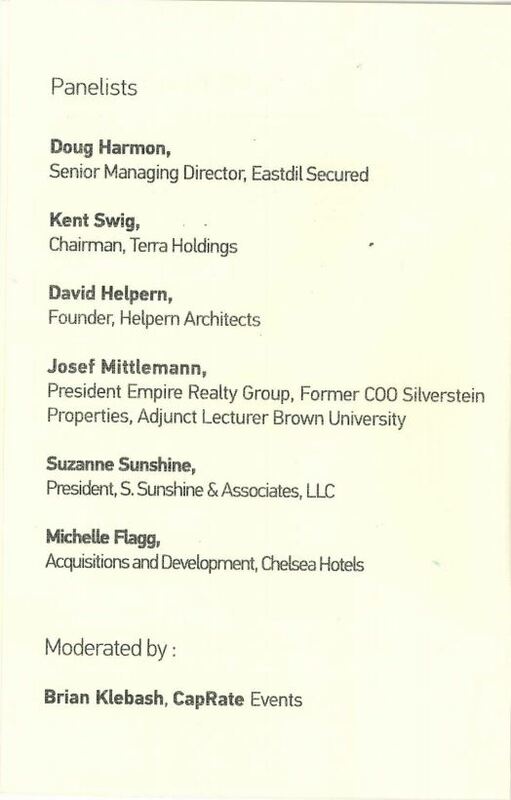 While the University doesn’t have formal graduate program in real estate, Brown is proud of having this industry leaders among its’ alumni. The program lasted about 90 minutes, while we discussed various real estate market issues, such as forces driving this market, investment opportunities, industry trends, the influence of the politics, climate zoning issues and many others. 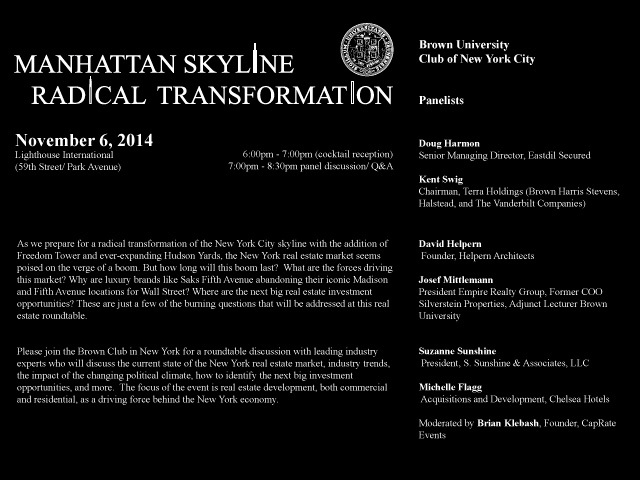 It was very interesting and informative, as we all shared our visions for commercial and residential real estate market.